Backstreet Records is the mail-order division of Backstreets. If you're looking for all things Boss, you've come to the right place. 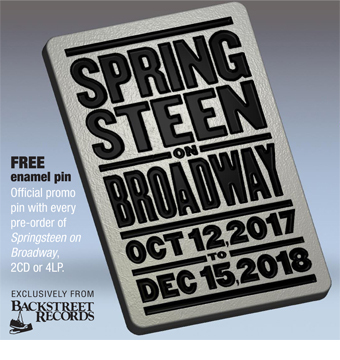 Springsteen is our specialty, and we carry every official item we can find. From music to memorabilia, our online catalog is packed with Boss merchandise in addition to Backstreets Magazine, and satisfaction is guaranteed. Backstreet Records is mail order you can trust. We're collectors and fans, just like you, so we'll treat you the way we'd like to be treated ourselves.